Response envelope: Matching champagne envelope with pearlescent finish. A2 size (4-3/8x5-3/4) Envelope lining inserts of blue tamarind mulberry tissue (you glue in liners). ***DISCONTINUED **** An Exquisite Wedding Invitation for a Formal Garden Wedding. DIY Gatefold Invitation with Sprig of Larkspur and double envelopes. Finished invitation measures 5 x 7 inches"
Landscape gate-fold of pearlescent Japanese card stock. (scored to fold and close neatly) Tissue onlay of tamarind mulberry tissue. Closes with a sprig of royal-blue pressed larkspur (real) flowers. Matching pearlescent champagne inner envelope lined with tamarind mulberry paper (you glue in the liners) and pearlescent outer, mailing envelope. Invitation Card:Heavy Italian pearlescent cardstock (105 lbs). Bellyband Sash:Lavender mulberry unryu which glues at back. 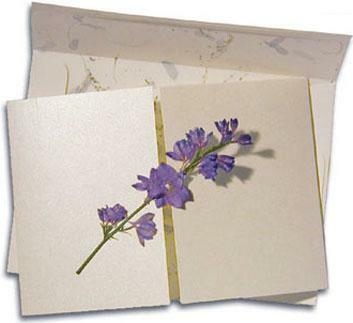 Pressed Flower:Sprigs of real pressed larkspur flowers - blue-purple color. Inner Envelope:Matching Lavender 70 lbs. pearlescent Italian paper. Outer Envelope:white pearlescent A8 size (6x8) envelope.